Although laparoscopic hepatectomy has been proven to be safe and reliable, the influence of tumor size on the feasibility of laparoscopic left lateral segmentectomy (LLLS) is unclear. We retrospectively reviewed our surgical results focusing on hepatic tumor located in the left lateral segment. 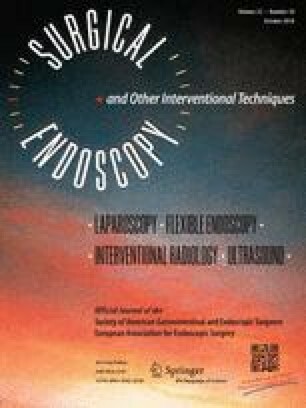 From January 2003 to June 2016, patients who underwent left lateral segmentectomy were retrospectively reviewed, and data were collected on patient characteristics, peri-operative outcomes, and pathologic results. Patients with intrahepatic stone, cystic lesion, or unmeasurable tumor size were excluded. The continuous variables were compared using the Mann–Whitney U test and categorical variables using the Chi square or Fisher’s exact test. The overall and disease-free survival rates were computed using the Kaplan–Meier method and compared using the log-rank test. A total of 103 patients were enrolled for analysis. Among the patients with tumors larger than 5 cm in the left lateral segment, those who underwent laparoscopic surgery had significantly shorter hospital stay and larger resection margin than those who underwent open surgery. The surgical results of the patients who underwent LLLS were not significantly different from those of the patients with tumors larger than 5 cm. Specifically, the 5-year overall survival and disease-free survival rates of the patients with hepatocellular carcinoma (HCC) larger than 5 cm who underwent LLLS were comparable to those of the patients who underwent open left lateral segmentectomy. LLLS is safe and also feasible for hepatic tumors larger than 5 cm. For HCCs larger than 5 cm, the laparoscopic approach yields satisfying oncologic outcomes as the open approach. Chung-Ching Chou and Yi-Ting Yen contributed equally to this manuscript. The authors are grateful to Editage for the revisions of grammar, sentence construction, word choice, and syntax. Dr. T-HY: contributed to patient care, study design, data management, data analysis and writing, revision and approval of the manuscript. Dr. J-LC: contributed to performance of surgery and patient care, study design, and approval of the manuscript. Dr. Y-JL: contributed to performance of surgery and patient care, study design, and approval of the manuscript. Dr. Y-JC: contributed to performance of surgery and patient care. Dr. Y-SS: contributed to performance of surgery and patient care. Dr. H-PH: study design and data analysis. Dr. Z-MS: contributed to performance of surgery and patient care, study design, and approval of the manuscript. Dr. C-CC: contributed to performance of surgery and patient care, data collection, data analysis, study design, and approval of the manuscript. Dr. Y-TY: study design, data management, data analysis, and revision and approval of the manuscript. This study is granted by the National Cheng Kung University Hospital Research Grant No. NCKUH-10603054. The authors Tsung-Han Yang, Jen-Lung Chen, Yih-Jyh Lin, Ying-Jui Chao, Yan-Shen Shan, Hui-Ping Hsu, Zhe-Min Su, Chung-Ching Chou, Yi-Ting Yen have no conflicts of interest or financial ties to disclose.